You don’t have to wait until you need cheering up though folks! Our bubble football southend venue is fantastic to hire out for family parties (and not just the kids! ), hen do’s, stag do’s, team building events, Fun Days and Fundraising or any event that could do with a bit of life injecting into it. As every venue is equipped with private 4G, changing rooms and showers as well as sports and cocktail bars, you can even keep the party going together afterwards too! If you’re on the hunt for something fun to do then look no further – you’re here! Bubble Football (or Zorb Football – it’s all okay we’re not fussy!) is one of our favourite ways to get the heart racing again with laughter, frivolities and a (mostly!) healthy dose of competition to boot. And you’ll be pleased to know we now have a bubble football Southend venue! Looking for something to do with the kids or teens over the holidays here in Southend? Why not gang up with some other parents (or maybe ‘collaborate is a better word eh?) and blackmail the kids, erm we mean incentivise them, into doing a chore or two, or even (dare we say it) some study or homework and give them a bubble football session as a reward! Don’t tell the kids but we think that’s clever parenting! Exercise and fun in one ‘foul’ swoop without the red card of course! We first introduced the fantastic Zorb to the UK and since then we’ve done our very best to ensure our service is first class for miles around. In fact we take pride in being the best that the Zorbing Business has to offer and have built our reputation on those grounds. If our successful events are anything to go by we’re doing a good job. Session times are based on the number of participants. 1 hour is for up to 20 people and 90 mins is for up to 40 people. All sessions include pitch hire, fully-trained (and CRB-checked) staff, the use of venue and comprehensive insurance cover. This is a very safe sport, but if you book with us, all our staff are fully trained in first aid, and carry first aid kits with them for you peace of mind. Our grown up worlds can get a little bit boring sometimes so if you ever need cheering up – maybe your footy team lost, your other half is ignoring you again or you’re not allowed to buy that latest iPhone yet – then come and play with us and we’ll have you forgetting your woes in an instant. You can’t not smile like a 5 year old when you’re running around like a crazy thing with your mates with a massive clear bubble on your head, chasing a football, probably in the wrong direction and generally ‘having an absolute ball’ (pun most definitely intended there!). Whether it’s entertainment for adults or children you’re looking for, we can use our years of experience to tailor your event to your needs and also bring the activity to you even if you’re not here in Southend as we have locations all over the country. If you are interested in hiring out our bubble football Southend venue, then simply get in touch and we can talk you through what’s on offer and we promise you we keep it all simple – for starters there’s no offside rules round here peeps! 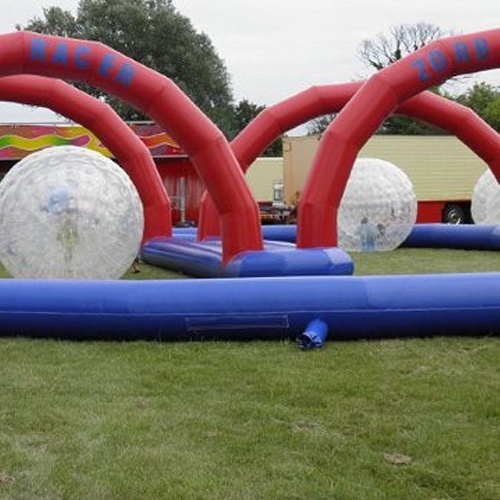 Zorbing Hire UK have venues all over the country which you can hire out for birthday parties, stag do's and business team building events. They even have three venues in Essex where they are based in Southend, Colchester and Romford.